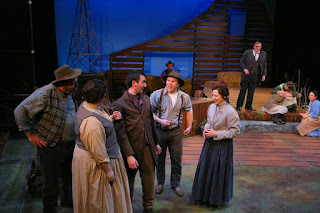 "This play is perfectly theatrical... it would be like if you took Little House on the Prairie and it has a little whiskey... and got together with The Wizard of Oz and Gunsmoke and A Prairie Home Companion and a Jane Austen novel and a medical textbook and spawned a theatrical love child! That would be Anatomy of Gray." 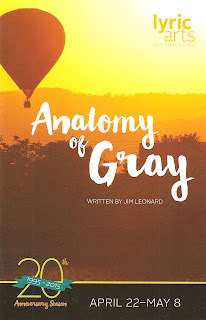 I love all of those things (OK, except maybe for a medical textbook), so how could I resist Lyric Arts' current production Anatomy of Gray?! Director Scott Ford's description turns out to be quite apt, and I might also add a little The Normal Heart and even the similarly titled Grey's Anatomy to the mix. 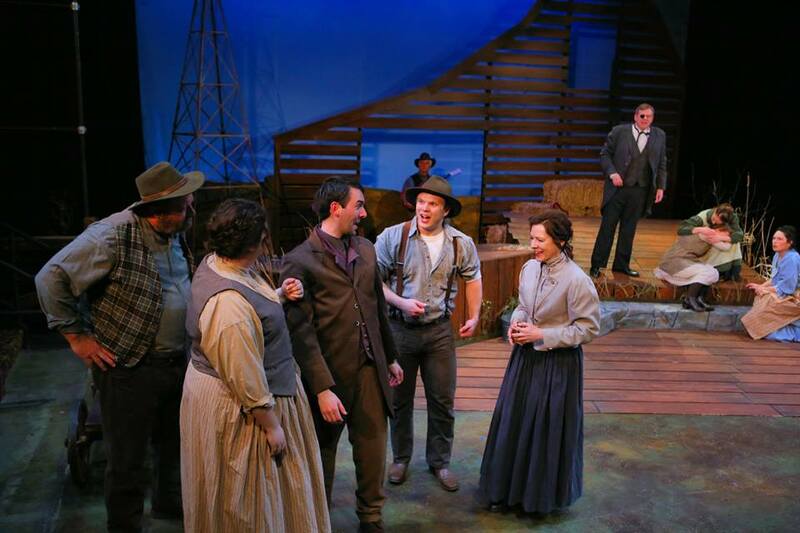 Anatomy of Gray is a sweet, funny, moving little play about the joys and sorrows of frontier life in the late 19th Century that poignantly reminds us that "we all come from love and loss." 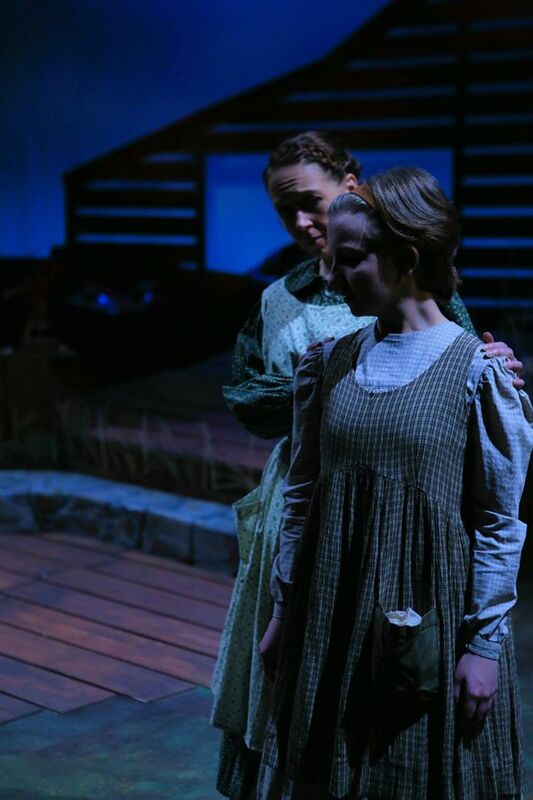 The heroine of our story is young June Muldoon (an appealing Nykeigh Larson), a 15-year-old girl who's destined for bigger things than can be found in her boring little hometown of Gray, Indiana (I wonder if it's near that other famous theatrical Indiana town, Gary). She soon gets the excitement she wished for when her father dies suddenly, leaving her and her mother (Jessica Scott) grief-stricken. Then, in the midst of a tornado, a doctor arrives in a hot air balloon (this is where The Wizard of Oz comes in). The coincidentally named Dr. Gray (Ty Hudson) is the first doctor the townsfolk have seen, and he's met with a mixture of curiosity, apprehension, and appreciation. Despite the fact that he's a doctor who faints at the sight of blood, he helps people with their ailments ranging from arthritis to insomnia to pregnancy. He even performs rogue surgeries just like they do on Grey's Anatomy, with the help of his assistant June. When a mysterious illness strikes the town, he's blamed for its occurrence despite the aid he offers. Like AIDS in The Normal Heart, no one knows what causes it, how to treat it, or how it's spread. But our heroine June is a survivor, and survive she does with the help of friends and family, and through her own intelligence, curiosity, and determination. Playwright Jim Leonard has each of the characters take turns narrating the story, most often June herself, which draws the audience right into the drama. The production feels like it's right out of the 1880s. The set includes elements of the outdoors and a working water pump, with the silhouette of a barn and windmill as backdrop, and soft lighting setting the tone of each scene (scenic and lighting design by Jim Eischen). Stacey Palmer's costume design also evokes the time period and defines each character. Last but not least, musician Warren Sampson provides a sweet and melancholy soundtrack on steel guitar. I love stories of the Midwestern frontier because it's like watching my own ancestors tell their story. That's true of this story as well, and while it has some fantastical elements and more than one cliché, it's also grounded in reality and humanity. It shows us that people in the olden days weren't that different from us; they had hopes and dreams, fears and hardships, family and community. Anatomy of Gray continues through May 8 at Lyric Arts' Main Street Stage in charming downtown Anoka.